Invite readers to support the sharing of information, knowledge and technology in aquaculture to keep it improving. Suitable for beginner in aquarium or pond hobbyist and also for freshwater and marine aquaculture. Tremendous job by Mr.Pete in building his own biofilter for his own use. 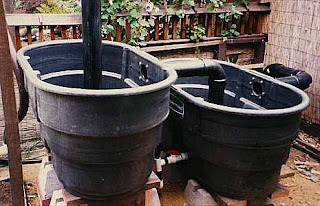 He research and build a biological filteration system for the existing pond. The most common biofilter uses various sizes of gravel as the filter media in an out-of-pond box. Many include a prefilter to trap large particles before they reach the biofilter media, extending the time between cleanings of the biofilter. A bottom drain is a common feature for flushing sediment and muck out of the filter. Most filters also provide some means for aerating the water to create an oxygen-rich environment for the bacteria that colonize the media. Hi, interesting blog & good post. overall You have beautifully maintained it, you must submit your site for free in this website which really helps to increase your traffic. hope u have a wonderful day & awaiting for more new post. Keep Blogging! This blog purposely created for owner study reference.